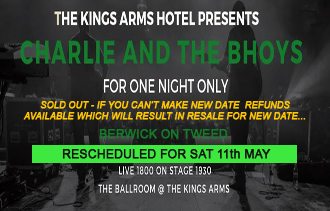 RESCHEDULED DUE TO ROOF DAMAGE AT VENUE. NE DATE 11th MAY. ALL TICKETS VALID. IF YOU CAN'T MAKE THE NEW DATE CONTACT TICKET PROVIDER FOR REFUND.